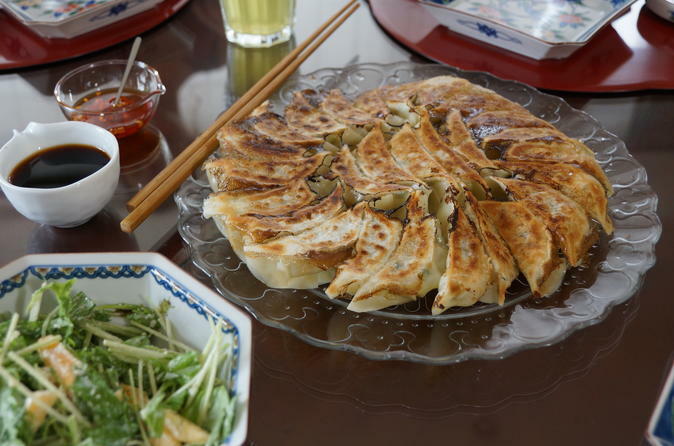 Learn to make home cooked gyoza dumplings in a private home of an English-speaking local in central Tokyo. This 2.5 hour culinary experience will not only teach you how to make two kinds of gyoza dumplings but also give you an opportunity to visit a Japanese home. This course will use store-bought gyoza wrappers to make fried pork gyoza and boiled shrimp gyoza. Vegetarian options are also available upon request. The class takes place in a private home located within walking distance from Meguro or Gotanda Station of the JR Yamanote Line or a Metro Station. You will be greeted by your instructor who is fluent in English and will be able to give you an insight on local life as well as suggestions on shopping and tourist attractions in Tokyo. She will start off by a making a vegetable side dish or a salad. Next, the instructor will demonstrate how to make two kinds of gyoza, potsticker, fillings, one for the fried gyoza and the other for the boiled gyoza. Then you will get an opportunity to wrap your own gyoza. Finally, all the gyoza will be fried and boiled. After all the gyozas are cooked, there will be a tasting session served with hot or cold tea and dessert. Aprons will be provided and an English Recipe Sheet will be available to take home.